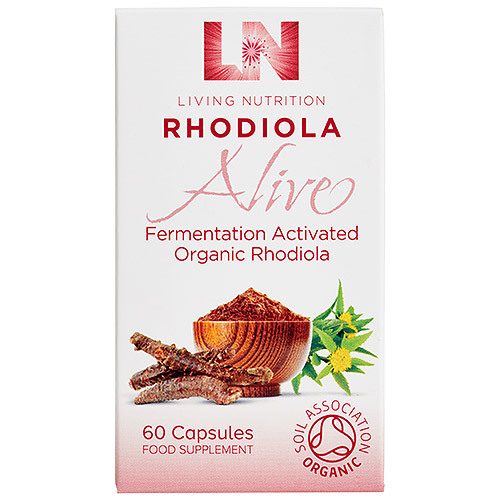 Living Nutrition`s Rhodiola Alive has enhanced bio availability, increased nutrients and is 100% organic. It works to improve stress and fatigue. Rhodiola is a potent adaptogenic herb grown in the extreme mountainous conditions of Siberia and Northern Asia providing an ideal support for today`s busy lifestyle and times of exertion. Living Nutrition use the ancient art of fermentation to activate and enhance its potent adaptogenic qualities to help with the modern day stresses of day-to-day life. Living Nutrition manufacture a range of foods and herbs, which are 100% fermented using a patented kefir-kombucha fermentation process, containing 35 strains of microorganisms to create a living matrix of bio-activated enzymes, nutrients and microorganisms. (Fermented, freeze dried) *Rhodiola (Rhodiola rosea) root, *Rhodiola (Rhodiola rosea) root, *Ginger (Zingiber officinale) root, Vegetable cellulose capsule (hydroxypropyl methyl cellulose). Take 1 to 2 capsules a day, at least 30 minutes before food. This product should not be used as a substitute for a varied and balanced diet, and a healthy lifestyle. If you are nursing, pregnant or considering pregnancy, you should consult your healthcare practitioner prior to using this product. Below are reviews of Living Nutrition Rhodiola Alive - 60 Capsules by bodykind customers. If you have tried this product we'd love to hear what you think so please leave a review. 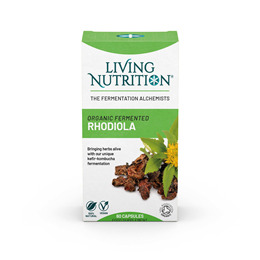 Living Nutrition`s Rhodiola Alive has enhanced bio-availability, increased nutrients and is 100% organic. It works to improve stress and fatigue.